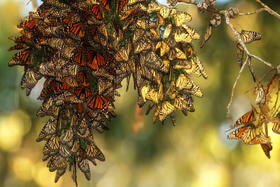 Monarch butterflies are disappearing. Scientists agree that in the last 20 years, populations of the black and orange insect have been in precipitous decline. But there's much less certainty on what’s causing them to vanish. As each new scientific paper on monarch decline is published, the image becomes slightly less opaque. So far, potential culprits include disease, climate change, drought, deforestation, and nectar plants. Blame has been cast on everyone from loggers to farmers to suburban developers. In the battle to save the migratory monarch, advocates have zeroed in on a simple, leafy weed. Every spring hundreds of thousands of monarchs sweep across the Great Plains from Mexico to Canada, and then back again in the fall. It’s an amazing journey, one that takes place over multiple generations for the butterflies. The insects breed while traveling north, expending four generations to make it to Canada. The final one flies all the way back to Mexico to spend the winter. Monarch populations are measured in hectares, with one hectare equating to roughly two and half acres. Surveys of their wintering habitats in the central mountains of Mexico show dense populations of monarchs at an average of more than nine hectares during the winters from 1995 to 2002. In 2014, monarchs took up less than one hectare. Since the late 1990s scientists have been trying to find the pinch point for monarchs, just where in the migration they are losing ground. The weed central to the effort to boost monarch populations is milkweed, a class of more than a hundred varieties of leafy green plants, so named for the milky sap that oozes from its stem when snapped. It’s literal lifeblood for the monarch caterpillars, serving as the insect’s sole food source early in their life cycle. The plant serves no utility though for Midwest farmers and is oftentimes plowed under, pulled out or blasted with herbicides. That’s led community groups, conservation activists and government grants to make their way into rural America, determined to slowly reshape the Great Plains in the hope that more milkweed means more butterflies. Bob Trout is one of those volunteer leaders. He’s the head of the Loveland Initiative for Monarch Butterflies, out of Loveland, Colorado. On a windy, rainy spring morning, he was decked out in a bright orange jacket, working along the banks of the Big Thompson River. Trout is a big fan of monarchs. He’s in charge of a team of volunteers, here to plant the edges of small ponds and the river’s banks with milkweed. Volunteers use hammers and stakes to make holes in the hard-packed soil. “We’re trying to save the migration is what we’re trying to do,” he says. Trout mentions the use of glyphosate, more commonly known as RoundUp, the ubiquitous herbicide sold by agrichemical giant Monsanto, as a possible cause of monarch decline. Studies have shown milkweed abundance declined by 58 percent from 1999 to 2010. Without milkweed, Trout says, how are monarchs to flourish in a crucial migration corridor? That same question drove researcher Hidetoshi Inamine at Cornell University, a PhD student in evolutionary biology and ecology. His recent paper casts doubt on the importance of milkweed in monarch decline. “Monarch caterpillars feed exclusively on milkweed plants, so people always thought that the decline in milkweed is causing the decline in monarch butterflies,” Inamine says. But that’s not really the case. Idamine and a team of researchers found that most of the decline is happening when the butterflies turn around in Canada to head back south, no longer reliant on milkweed. When the butterflies are fully grown they feed on other plants, laden with nectar. With some nectar-bearing plants also on the decline, Inamine says that could be a far greater threat to the mature butterflies. So far, according to a recent National Academy of Sciences report on genetically-engineered crops and the claims about them, scientists haven’t been able to show that disappearing milkweed is causing the caterpillars to starve. “We don’t know what’s causing the decline per se, but what we can say is that it’s happening when they’re migrating down south to Mexico,” Inamine says. Previous studies have pointed the finger at Midwest farmers for destroying milkweed, and for planting corn with the insecticide Bt bred into the kernels. More recent studies, like Inamine’s, paint a larger picture, suggesting a combination of habitat fragmentation, severe weather, climate change, disease and deforestation is to blame. That said, there’s still “no consensus among researchers that increased glyphosate use is not at all associated with decreased monarch populations,” according to the NAS report. In the interim, some of the largest agrichemical companies in the world are stepping up to incentivize farmers to not only plant milkweed, but keep butterfly habitat from fragmenting even further. “We always look for simple solutions or simple blame,” says Caydee Savinelli, pollinator stewardship lead for the agrichemical giant Syngenta. Savinelli is part of a group of conservationists, ag companies and farm groups trying to restore and protect some habitat in the Midwest to provide more milkweed and nectar plants for monarchs as they migrate north and south. She says farmers have been receptive to keeping more butterfly habitat intact, but it’s taken some convincing. “In the case of milkweed after telling them for the past 30 years, you need to eliminate it, now we’re saying bring it back, so there’s going to be some learning for sure,” Savinelli says. Even if milkweed isn’t the likely bottleneck, scientists say planting more of it could give populations a boost as they travel north across the Great Plains. Back on the banks of the Big Thompson River in Loveland, Mary Pullen and her son Nick Balla are pulling tiny milkweed plants from their containers and planting them in the ground. Chickens aren't a traditional pet. But with chicken coops springing up in more and more urban and suburban backyards, some owners take just as much pride in their poultry as their dog or cat. So much so that they're primping and preening them for beauty contests. 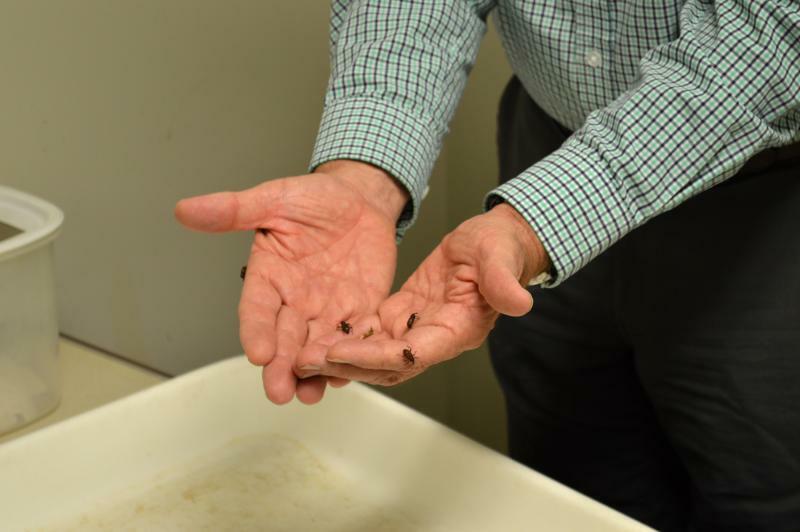 The Colorado Department of Agriculture is killing pests dead, without the aid of chemicals. 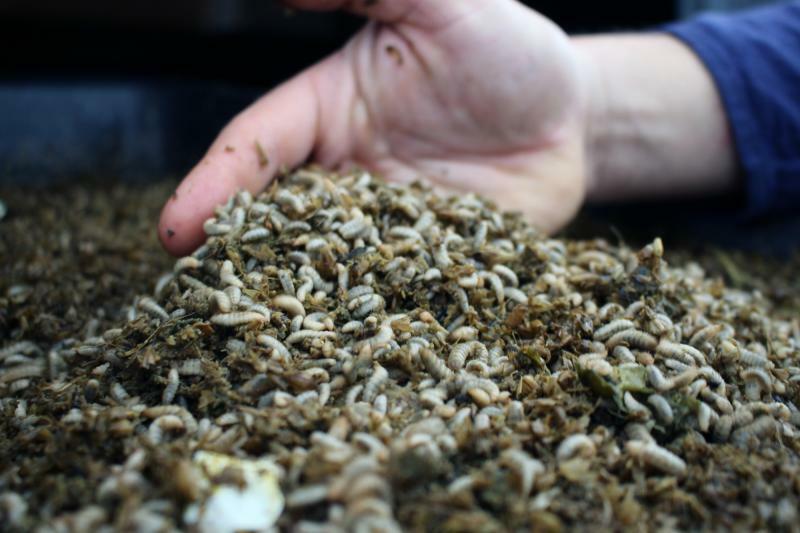 Halfway down a dead-end road in the small farming town of Palisade, Colorado, is the research facility known as “The Insectary.” Scientists at the lab develop “biocontrol insects,” insects adapted to attacking bugs and plants harmful to agriculture. Colorado’s Insectary is the oldest and largest facility of its kind in the United States.